U.S. stocks are closing higher after U.S. lawmakers reached a tentative deal to avoid another costly government shutdown. The deal could alleviate pressure on the market as the U.S. and China begin talks on their trade dispute. Major companies continue to report fourth-quarter earnings. Molson Coors fell 9.4 percent as weak volume dragged down profit and revenue. Elsewhere, Coty soared after investment firm JAB Holdings offered to acquire a controlling stake in the owner of CoverGirl. The S&P 500 gained 34 points, or 1.3 percent, to 2,744. The Dow Jones Industrial Average rose 372 points, or 1.5 percent, to 25,425. The Nasdaq added 106 points, or 1.5 percent, to 7,414. Bond prices fell. The yield on the 10-year Treasury rose to 2.68 percent. U.S. stocks are gaining at midday after U.S. lawmakers reached a tentative deal to avoid another costly government shutdown. The S&P 500 gained 33 points, or 1.2 percent, to 2,743. 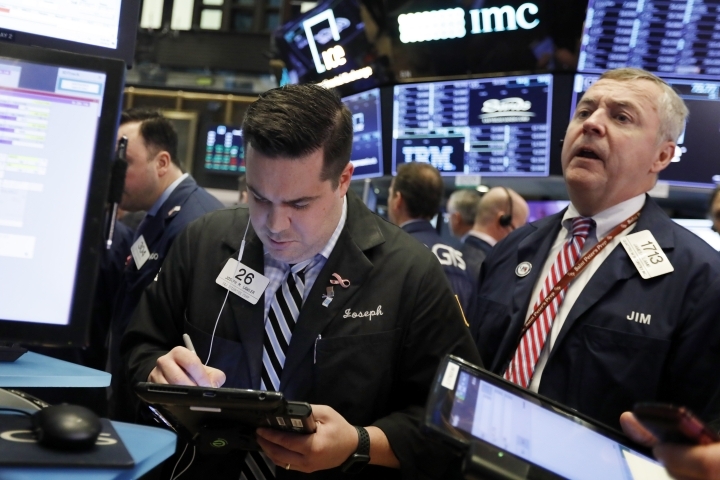 The Dow Jones Industrial Average rose 333 points, or 1.4 percent, to 25,392. The Nasdaq added 99 points, or 1.4 percent, to 7,407. U.S. stocks are gaining in early trading after U.S. lawmakers reached a tentative deal to avoid another costly government shutdown. The deal could help alleviate pressure on the market as the US and China head into talks to avert escalating their dispute over trade. Major companies continue to report fourth-quarter earnings. Molson Coors fell 6 percent as weak volume dragged down profit and revenue. Elsewhere, Coty soared after investment firm JAB Holdings offered to acquire a controlling stake in the owner of CoverGirl. The S&P 500 gained 19 points, or 0.7 percent, to 2,728. The Dow Jones Industrial Average rose 199 points, or 0.8 percent, to 25,252. The Nasdaq added 54 points, or 0.7 percent, to 7,360. Bond prices fell. The yield on the 10-year Treasury rose to 2.67 percent. Copyright © 2015 - 2019 The Up Stocker. All Rights Reserved. Established in 2015, The Upstocker provides insights on financial reports, commentary, and investment data to traders so that you can make better investment decisions.